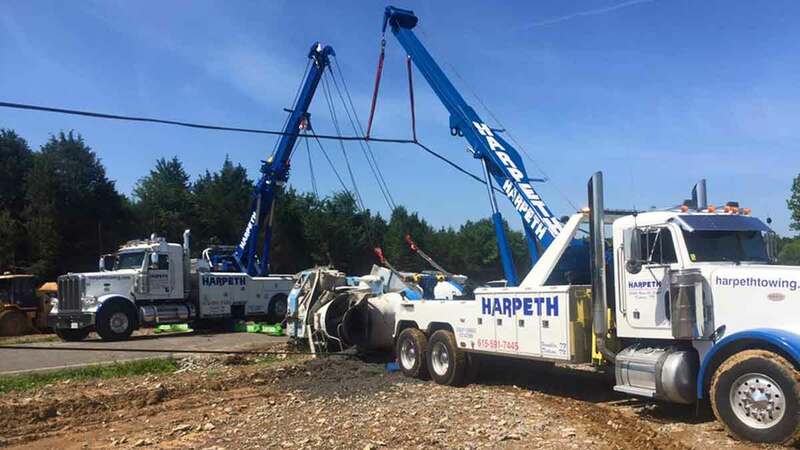 Heavy truck recovery company, Harpeth Towing & Recovery provides 24hr heavy duty recovery, heavy cargo recovery, and heavy truck accident recovery in Franklin, Dickson, Nashville and on I-65, I-840 & I-40 through Central TN. We also provide ag equipment recovery, semi recovery, load recovery and more throughout the state. Contact our Heavy Recovery Team at 615-591-7445 for professional and affordable Dickson heavy recovery services. 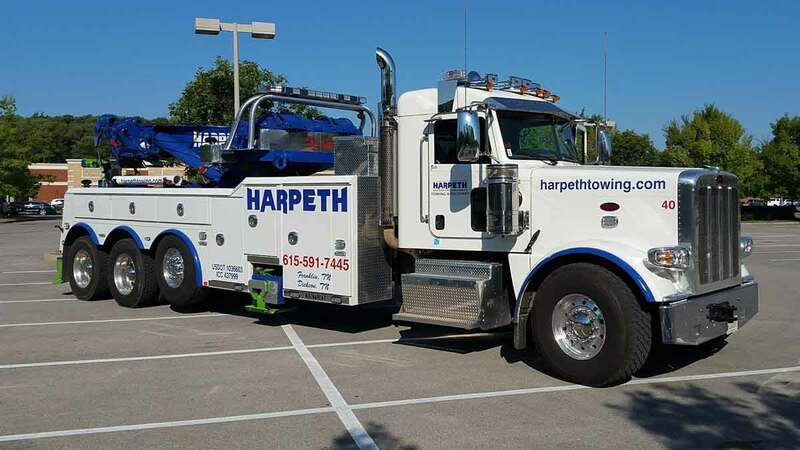 The Harpeth Towing & Recovery fleet consists of several heavy wreckers and a 50-Ton rotator, so you can be confident that we will get the job done right – the first time. If you’re stuck, we can get you out. Our team of heavy recovery specialists are Wreckmaster and Traffic Incident Management (TIM) Certified. Whether it’s mud recovery, snow recovery, semi up-righting, dump truck recovery, tractor recovery or off-road winching, you can trust the Harpeth Recovery Team to provide safe and secure recovery of your asset. Our experience minimizes damage and expedites site time to keep your costs as low as possible. Call 615-591-7445 to get Harpeth Towing & Recovery working hard for you. Harpeth Towing & Recovery provides heavy rotator service in Franklin, Dickson, Williamson County, and throughout Central Tennessee. Our 50-Ton Rotator allows us to provide top quality heavy lifting services for a fraction of the price of large crane companies. We have decades of experience with heavy material offloading, bunking and unbunking, placing AC units on several-story roofs, and more. Our mobile rotator service has proven to be a time and money saver for many clients. We can schedule the rotator to meet your delivery of heavy equipment, machinery or other heavy load to ensure the truck is loaded or unloaded as quickly as possible. Our Mobile Rotator Team is standing by and ready to help with your heavy lifting needs, so call 615-591-7445 to get Harpeth Towing & Recovery working for you. Harpeth Towing & Recovery offers air bag and air cushion recovery in Franklin, Dickson, Williamson County, and on I-40, I-65 & I-840 throughout Central Tennessee. Air cushion recovery is an efficient and effective method of heavy duty truck recovery, RV, bus and equipment recovery to expedite post-accident recoveries and minimize further damage to the vehicle. 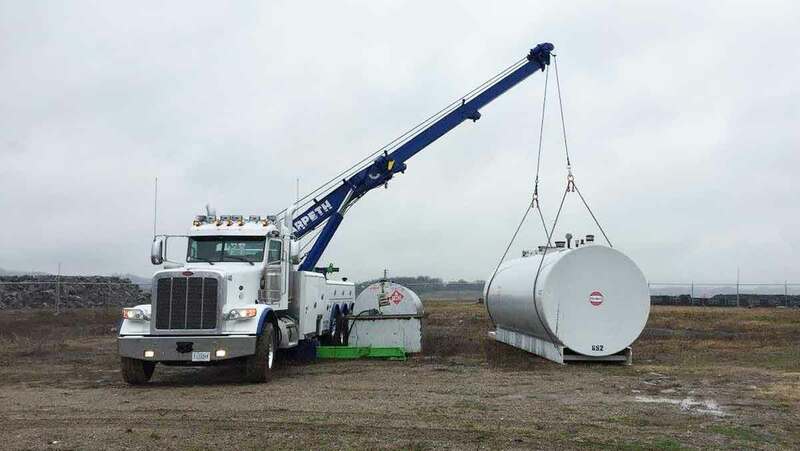 Saving your company time and costly cargo handling charges, air cushion recovery often eliminates the need for unloading trailers or otherwise shifting cargo to ensure a safe heavy duty accident recovery. Air cushion recovery is most useful for overturned semi-trailer recovery, underwater recovery and large equipment recovery and extractions. Call 615-591-7445 now to get Harpeth Towing & Recovery’s Air Cushion Recovery Team working for you.